With 50 singers and band, Music Director Michael Loughlin leads Darwin Chorale in another display of its immense diversity and talent by presenting familiar and not-so-familiar music from opera, oratorio and musical theatre. Charles Darwin University’s newly-refurbished theatre will host the concert at 5pm on 18 September. 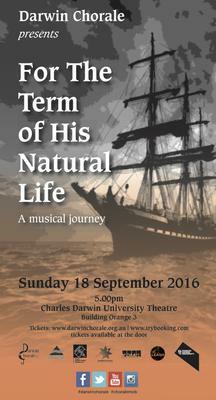 Inclusion of excerpts from Darwin musician Mark Hulsman’s musical For the Term of His Natural Life is an exciting feature of the concert. 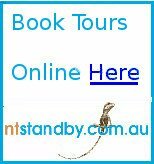 Premiered in Tasmania in 2004 to high acclaim, the show is based on the novel of the same name by Marcus Clarke and is a powerful story about an Australian penal settlement in convict times. If you enjoy Les Miserables and Phantom of the Opera, then you will certainly be moved by the music and lyrics of this new musical. The concert program also features the music of Verdi, Handel, Haydn and more. Arrive early and have a drink at the new theatre bar before you join the chorale for an memorable late afternoon concert of diverse music. Hi Trish, thanks for your comment. Darwin Chorale has a diverse program of different styles of music. I am unsure if there is a recording of the show at this stage but 'watch this space' as we may look at doing the full show down the track! The composer Mark Hulsman has been living in Darwin so we were fortunate to be able to work on some of his music with him.